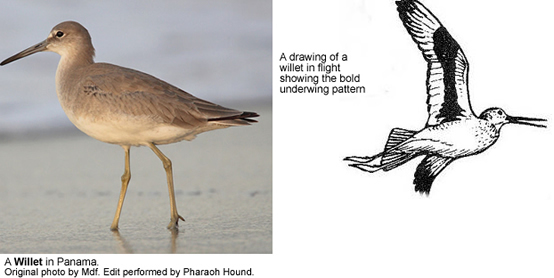 The Willet, Tringa semipalmata (formerly Catoptrophorus semipalmatus: Pereira and Baker, 2005; Banks et al., 2006), is a large shorebird in the sandpiper family. It is a well-sized and stout scolopacid, the largest of the shanks. Its closest relative is the Lesser Yellowlegs, a much smaller bird with a very different appearance apart from the fine, clear and dense pattern of the neck which both species show in breeding plumage. Two subspecies (which may well be different specie) have very different breeding habitats and ranges. 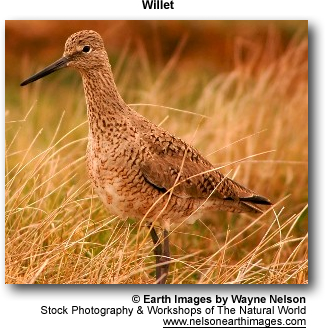 The Eastern Willet breeds in coastal saltmarshes from Nova Scotia to Mexico and the Caribbean. It winters on the Atlantic coast of South America. 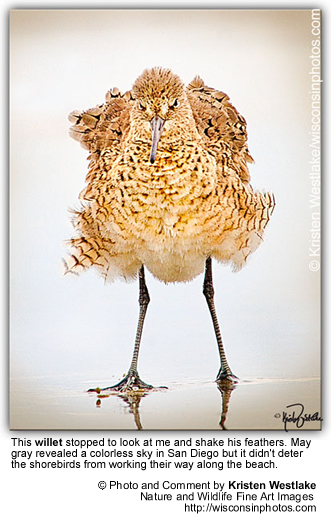 The Western Willet breeds in freshwater prairie marshes in western North America. It winters on both coasts, from the mid-Atlantic states south to at least Brazil on the Atlantic, and from Oregon south to Peru on the Pacific.